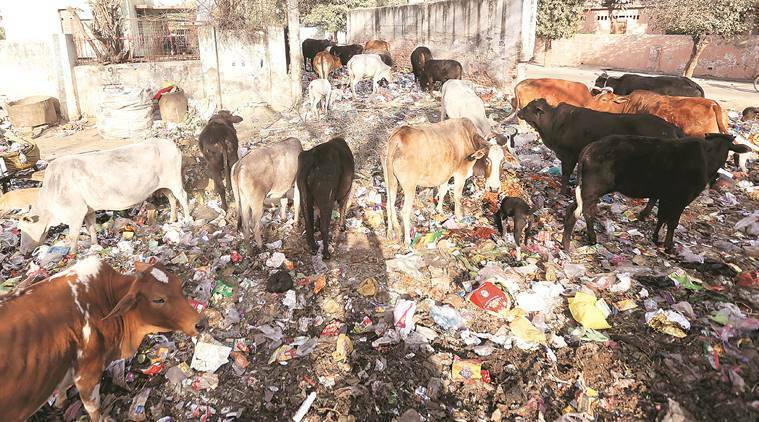 Tension prevailed in Mauranipur area of Jhansi district after 22 cows were found dead while 32 others lying unconscious at a government-run wholesale grain and fruit market on Sunday. While the autopsy report could not confirm the cause of death, police suspect the cows died after eating grains laced with insecticides. Following the incident, Vishwa Hindu Parishad (VHP) workers gathered at the market and allegedly forced some shops to down their shutters. They even blocked a road near the market and staged protest. They demanded investigation into the matter and arrest of those responsible for the deaths. The protest ended after police informed the VHP men that a case has been lodged into the deaths against unidentified persons. Veterinary doctors treated the cows found unconscious and their condition is stated to be normal now. Jhansi’s Senior Superintendent of Police (SSP) Jitendra Kumar Shukla said that viscera has been preserved for further lab test as the autopsy could not ascertain the cause of death. The SSP added that an FIR has been lodged against unidentified persons under IPC Section 429 (mischief by killing or maiming cattle, etc., of any value or any animal of the value of fifty rupees). Contacted, VHP’s Jhansi district secretary Anchal Arjaria said that after coming to know about the deaths of the cows, both their and Bajrang Dal’s workers rushed to the spot. “We protested and demanded strict action against those responsible for the deaths. Shops in the market remained closed on Sunday,” Arjaria said.